Compression therapy gloves for arthritis pain relief. SIZING: For best fit, see sizing chart in the images above for the correct size. We stand by our products with excellent USA based customer service and a 60-day product guarantee. 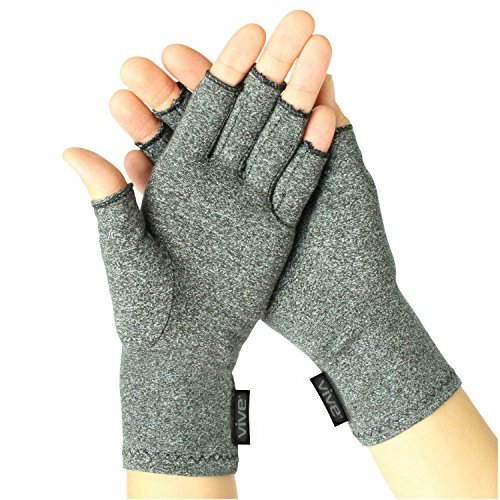 OPEN-FINGER DESIGN: These gloves have holes in each fingertip so you can still perform everyday tasks while wearing them. PAIN RELIEVING COMPRESSION: Form-fitting material embraces your hand and provides gentle compression to alleviate pain caused by arthritis. SMART SEAM DESIGN: Produced with minimal stitching to eliminate irritation. ALL DAY WEAR: Made of lightweight, breathable material so you can comfortably wear them all day long. VIVE GUARANTEE: We stand by our products with excellent customer service and a 60-day warranty.